There are various temples with the name Oryu-Ji in Japan. There are also temples with this name in China and Korea.
. Yamabuki <> Yellow Daruma . In Japan, the Azure Dragon is one of the four guardian spirits of cities and is said to protect the city of Kyoto on the east.
. temples named Seiryu-ji . It used to be called 大雲山龍玄寺 when it was founded in 1468. 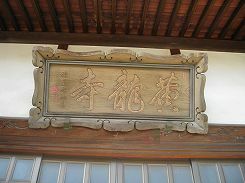 In 1758 the name changed to Oryu-Ji. The remaining buildings of the entrance gate, main hall and Zendo hall date from 1767. CLICK for more amazing images ! The name describes the tail of a yellow dragon slithering through a valley, helping the King of the Xia kingdom, Xiayu, create the Min River here at Huánglóng (Huánglóng Jǐngqù; Yellow Dragon Valley; www.huanglong.com; admission Y200; 7am-6pm). A national park, it is indeed laced with a golden-hued calcium carbonate which, in the right light, certainly could lead one to conjure an altruistic mythical beast. All the colours of the rainbow are here, actually, the landscape studded with waterfalls and terraced, coloured limestone ponds of blue, yellow, white and green. 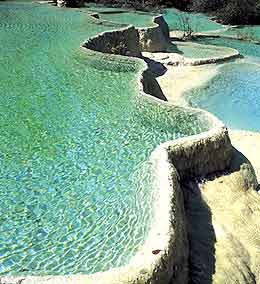 Consequently, it has earned the nickname Wǔcǎichí (Five-coloured Pool).